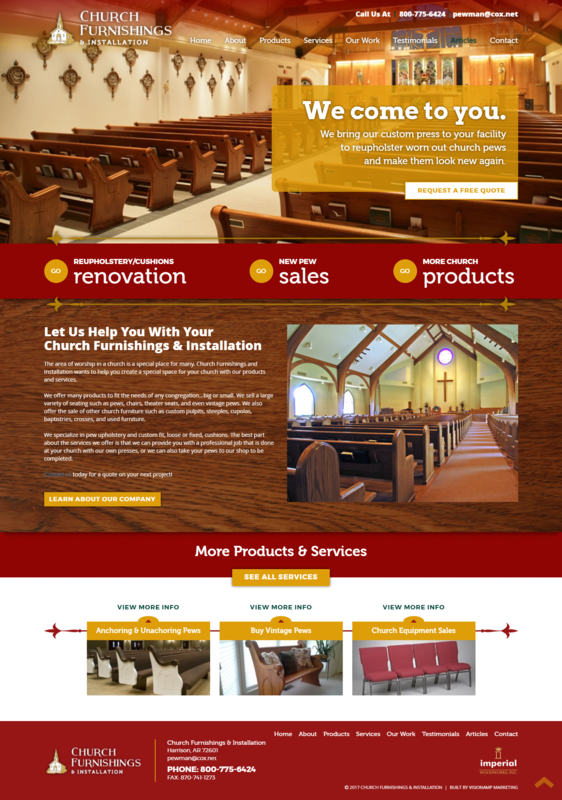 In addition to inviting, eye-catching photography on the home page, we chose a color scheme that complimented the brand and business of Church Furnishings and Installation. We also created an easy to follow navigation menu, which allows users to find what they are looking for quickly. This site is fully responsive and mobile friendly on any device. Church Furnishings and Installation, headquartered in Harrison, Arkansas, specializes in pew upholstery and custom fit, loose or fixed, pew cushions. They come to your church with their own presses to complete jobs with as little disruption to your santuary as possible. Church Furnishings and Installation also sells a large variety of seating such as pews, chairs, theater seats, and even vintage pews as well as other church furniture such as custom pulpits, steeples, cupolas, baptistries, crosses, and used furniture.